The first inspiration for The Illumination of Gaia left me stumped. I knew the look I wanted for the painting, but lacked a model for Gaia herself. A few days later a Peruvian healer friend of mine dropped by the house for a visit. I had not seen her in some time, but quickly realized she would be an excellent model for my new painting. A woman of striking appearance, she carries a great earthy energy. I asked her to pose for me and not only did she agree, but she delighted me further by not freezing up or becoming self conscious. Some people immediately turn into awkward sticks of wood, so this ease in modeling is not to be taken lightly! That let me proceed with the painting I had visualized. 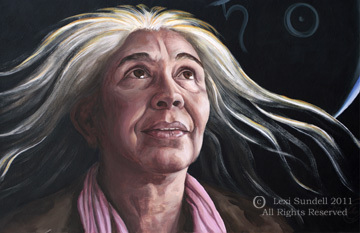 I did not particularly paint a portrait of my friend, but used her features to create an image of a wild earthy goddess. I wanted her face illuminated with the strong beauty of a divine feminine vision. I initially intended to paint the orb of the Earth with night time lights. However, I spontaneously painted the inside of the Earth instead, adding several alchemical symbols that deal with the transformative process. 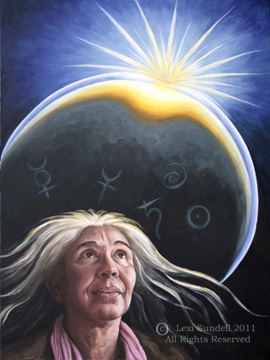 The theme of this painting reflects my own contemplation of the upcoming Earth Healing Retreat February 19-23, 2011. I will be teaching an exciting new Earth Healing CCT class along with a watercolor workshop. In the watercolor workshop we apply the creative processes of Earth Healing to unleash creativity in a powerful way. More information can be found at my Art Energies site. The painting is done in acrylics on canvas, 30" wide by 40" high. The original and limited edition prints areavailable at RiverStone Gallery. This entry was posted in Art Paintings and tagged acrylic painting, acrylics, Earth healing, painting flowers on January 18, 2011 by Lexi Sundell. Magnificent! Wow! Truly amazing. Thank you for sharing this, Lexi! Quite satanic, right? Maybe you should consult an exorcist? And as far as the Peruvian healer goes, Hell is waiting for her also, meaning you too. Ciao. You still have time to repent before the final eternal judgment. Ever wondered what is creativity and how it is connected to divinity? satanic? come on ….no violence here, no evil intended here,just because it represents another way to express divinity its evil? thats why i dont like christianity, they are the best to oppose to everyone thats different than them and the first to call to arms. Nice painting , soothing , maybe a bit funny and very i really mean it , really gentle and peaceful ans inspirational. you taking the time and energy to put this article together. Great internet sitewebsite! It looks very expert! Keep up the helpful work!